Adjust lateral and vertical release values with a single screw to customize for your weight and skiing preferences. Features the standard Dynafit toe locking mechanism with both skiing and locked modes. Additional riser plate versus the Low Tech Race offers a second option for those steep climbs. Made with forged aluminum and high-strength plastic to endure the grind of everyday touring. Optional adjustment plates can be installed under the toe and heel to give boot sole length flexibility. Same 4 hole drill pattern as the Low Tech Race binding toe, though the rear heel screw is further back. Racers will like this binding for reasons described in our article Dynafit Race Bindings. Non-racers beware, there are a few gotchas that come with such an amazingly light binding. The heel piece has no fore/aft adjustment, so unless you add the optional adjustment plate, make sure to get a precision mount done by a professional to match your boot or you may experience some pre-release. There is also no "flat" riser setting, as the risers drop over the heel pins. 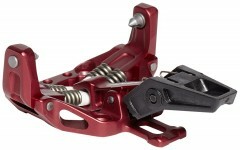 The binding is only designed to rotate as part of the release mechanism. Low Tech Racers will have a weight advantage over Superliters of 75 grams (2.6oz) per binding. The Superlites, however, will save you $250 and let you customize the release values for your weight and ability. You could also be standing taller on the steep climbs with an additional riser option. Speed Radical users will enjoy the flexibilty of a flat riser setting and a quiver of boots with a full 25mm of fore/aft heel adjustment. They may also brag about the Power Towers in their toe pieces which ease entry and protect from side impacts. But skiers with Superlites might not hear them as they are lugging 161 fewer grams (5.7oz) uphill and are already out of earshot. Bottom Line Perfect blend of race weight and safety. Would this binding work with the Dynafit beast boot? Mathias- Yes that boot is compatible. Do these have an «unofficial flat» setting like the superlite 2.0? Hi Anders, they do not. Are these compatible with other Dynafit toe pieces? I haven't done a deep internet dive into compatibility between various models, I have a line on Superlite 1.0 heel towers with the adjustment plate but one of the toe pieces is broken, hoping to replace with a matching pair and am finding some used toe pieces but wary of any "contraindications". Currently looking at Radical ST toe pieces. Hi lucas, auto-locking toes are contraindicated, but otherwise you can likely make things work. Advice is to do some release testing and not rely on the indicator numbers for franken-bindings. Thanks jbo and you win best internet tech response prize for replying about a question asked about outdated binding on Xmas day! I did a bit more nerding out, and discovered the speed radical toe pieces are, according to the massively useful Skimo binding height chart, at 29 mm, while the Superlites are 28.5, so that is promising. With the adjustment plate adding about 5 mm to the towers that means I'll have 36 mm in the back, which is a +7 spread. Do you think that there will be toe release issues because the spread on the speed radicals is +16 mm? Hi Lucas, thanks for the feedback! The delta should cause no problems in this context. Hi there, I have these bindings new, out of the box with no instructions, can anyone tell me what this plastic 'cage' thing is on the heel of the binding? I asked a fellow tech and they think it might also be a pin protector? What does this do? I assume it needs to be removed before use? If so, how does one remove it? Hi Confused. It's a mounting aid which disables the lateral springs so you can access the screw holes more easily. Pops out easily when twisted. I just bought these bindings second hand and was thinking of mounting them on a 115mm waist ski for mountaineering skiing. Is that too bulky of a ski for these bindings? Hey Michael! That's a huge mountaineering ski and definitely on the very upper limit of what this binding is probably really capable of. If it's not a relatively soft or really lightweight ski, I wouldn't mount this binding to that ski. Because of that fact, your boot selection is going to play a super important role in how this binding performs. With boots less than 1200g, you're probably fine (as long as the ski is soft or extremely light), but boots with more brute strength (this is a big generalization, but basically anything over about 1400g per boot) would likely overpower the binding. Hi There! 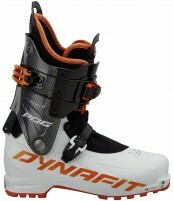 Do these bindings share the same mounting pattern as used for the Dynafit Stoke ski? Hi John the toe will work with only one mounting position. The heel will not work. Do these bindings use T-20 torx screws for mounting on the ski? Thanks. Hi Sergio, yes they use the 12.5mm T20s. Somehow I missed that the heel riser is much lower than other Dynafits I was used to. Is there any aftermarket riser or 'nubbin' available for this binding? Hi John, unfortunately there aren't any aftermarket nubbins to my knowledge. Any ideas? Is this wrong crampon for this binding? Hi Andreas, they Dynafit crampons should work fine, especially the skinnier ones. Did you see how it was lost? I had my Speed Superlite bindings mounted at a local shop here in Boise. I notice that when I step into the binding there is a slight amount of play in the heal between the boot and binding. Is this typical? Hi John, there shouldn't be play between the boot and the heel pins. Give us a ring to diagnose. Hi Laurie, Dynafit doesn't provide a paper template for the Superlite. You might have to mark the holes by hand. 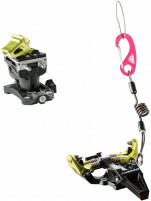 Has anyone used ski crampons with this binding? The small crampon widget that i installed doesn't seem to be wide enough to accommodate the crampon. Am I missing something? Hi John, yeah it gets used. What crampons do you have? It's possible a slight bend will help certain models fit. I agree with the other reviewers regarding this binding being a good price at a great weight. It's my new standard for price and weight and makes my Dynafit Vertical ST's seem too overbuilt. I've used it with Aliens on Cho Oyu skis for touring and skimo racing. One caveat to mention for skimo racing is that the second taller riser can get in the way when fumbling at transitions. I have found that riser sometime useful on steep skintacks while touring but I wouldn't miss it if it were gone. The ultimate combination of weight, performance, features and price for a serious touring binding! Assuming you aren't dropping cliffs or using this binding inbounds, I find that it offers plenty of performance for fairly aggressive skiing on a relatively large ski (184cm 99mm underfoot dynafit denali). The weight is incredibly low (1/3 of a radical FT) for the amount of performance it provides. I have not yet had a pre-release nor have I crashed and tested its release capabilities (but it is comforting to know it CAN release unlike the low tech race). The extra heel lifter, releasability and $250 savings (and likely greater durability) for a mere 75gram weight penalty over the Low Tech Race makes it a great buy for all but the serious racer. Only minor downside I have found thus far is the toe lever is harder to lock using your ski poles while standing up (being lazy and not wanting to bend down) than my old Vertical FT toe levers. Contrary to Patrick's comment about leashes, I was easily able to attach a small, homemade leash to the toe pieces. I have less than 10 days on these bindings so far so I cannot yet comment on their long-term durability but have not experienced any issues thus far. Overall this is a great binding that I highly recommend and plan to buy again for my next pair of skis! Hey there, any problems with using the narrower three screw heel pattern with a wider powder oriented touring ski, say 100-110 underfoot? Hey Pat, we don't have any accounts of problems, but there is probably some limit to the design. Other factors include ski length, construction, skier size, style, etc. For an average skier on a ski with decent binding area strength that width should not be a problem. Would these be the bindings to put on Dynafit PDG skis: speed superlite? Hi Thomas, those certainly make a decent pairing. I'll send you an e-mail with a few more questions to verify whether it's the right binding for you. I've been a longtime dynafit user of everything from classic tlt speed bindings to the FT12s and radical series. I wanted a binding that was as light as possible, but I was a bit concerned about going all the way to a pure race binding without release functionality. The Speed superlight has been a revelation. For one, it's miniscule but yet, for two, it retains releasability and a bit of riser. I was initially concerned about missing a flat walk mode. Never fear, it wasn't missed, even on longer flat sections. A flexible boot no doubt mitigates this, so you might notice if you're using this with a Factor, say, but that pairing doesn't make much sense anyways. The extra riser is not as about as high as the middle riser on other models, and that seems to cut it for basically every reasonable purpose with a flexible boot. I leave the high riser 50-degree skintrack to Andrew and company. I have skied this binding with the toe unlocked, but infrequently. Foolish, as I bought it to be releasable, but here's the catch: the toepiece leaves almost no room for a leash, and I sure do like my skis. I bet I can frig something together with zip ties, but otherwise, you're SOL for leashes. The price is a bit steep, but you get what you pay for: confidence in a tiny package. Everything you need and nothing you don't. This is nearly the perfect ski binding, as far as I can tell (the only thing I'll complain about is the color). The low delta has been a revelation. I find both the toe and the heel more user-friendly than my other Dynafit bindings (Vertical ST and Speed Classic). No pre-releases. I can still adjust the release values (important for a lightweight, non-agressive skier). I've seen lots of discussion online about the lack of a flat position in some race-type bindings. Coming from a nordic background, I was a bit worried about this, but it's proved to be a total non-issue. The lower position feels just perfect, for nearly all my skiing. I even skied three or four miles on groomed nordic tracks, and never felt tippy-toed. I hope they don't add a flat position, as it would make it more complex, and probably heavier. And what about the weight? I find it amusing that they weigh exactly the same as the Rotefella Super Telemark, the classic 3-pin binding that us old-timers used with leather boots and the dreaded Fischer Europa 99ST twenty-five years ago. Will you sell a six-pack of these bindings at a discount? That's how much I like them. 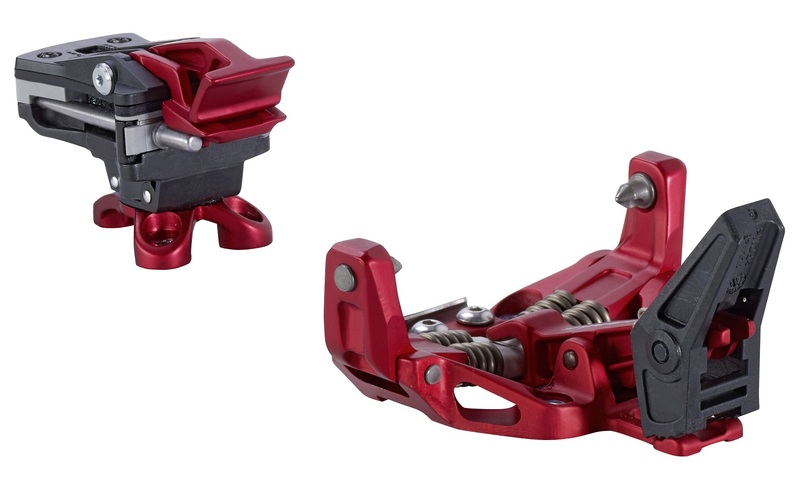 Overall: Five Stars for a binding that combines the reduced weight and heel>toe angles of a race binding with the adjustable release and multiple heel elevators of a regular touring binding. Now that La Sportiva is no longer rebranding the ATK RT, the Superlite’s “best-of-both-worlds” combination is unique in North America. Background on product familiarity: I have skied the Superlite only a small amount so far this season with the Scarpa Alien 1.0 on the Movement Response-X. Other race and near-race bindings I have used include various Plum models, Sportiva-branded ATK RT, and the Dynafit Low Tech Race. First, the first impressions out of the box: The innovation is immediately striking. 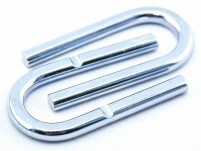 The stripped-down toe unit is identical to the Low Tech Race, but with a plastic toe lever lacking a spring. The heel unit is an intriguing synthesis of race and tour elements. The toe mounting pattern is identical to regular Dynafit Radical models. The heel pattern has only three screws, very tightly clustered, although noticeably elongated compared to the Low Tech Race. 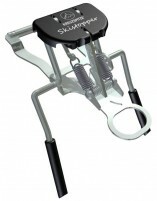 A removable ski crampon attachment is included in the price. As with full-on race bindings, the heel cover offers a kind of “half-step” elevator position, which is optimal for optimal skin tracks, but feels a bit too low for too-steep skin tracks. Flip down another lever, and you have a higher position – still not quite as high as the first position in a typical touring binding, yet noticeably higher than on any race binding. If you feel the need for more of a differential between the heel elevator positions, I have seen a relatively simple modification to achieve that. For extended flats, the heel unit will not stay sideways for no elevator at all, but even on race and “near-race” models that rotate for a no-elevator position, I have almost never needed that. As is also typical of race bindings, the heel > toe “delta” for skiing is very low (more than the Low Tech Race, and about halfway in between the Plum 135/145 and 165, although these are all very similar), which helps with fore-aft balance. (By contrast, more binding “delta” puts almost all skiers more into the backseat – think of where your hips go when hiking down a steep pitch.) The optional fore-aft adjustment plate would increase the heel > toe differentials. Second impressions, in use: I have never prereleased, although my vertical is very modest so far. The ski crampon clasp is identical to that on Plum race bindings: very minimalistic, but has worked well for me on those binding for lots of steep tricky skinning. And its minimalistic design allows some subtle bending to accommodate variances among different crampon brands. Although the release values are adjustable, the lateral and forward settings are linked to each other, so you’ll have to compromise if you typically run a higher forward setting than for lateral (as I do). The scale is also very small and hard to read (even by the standards of other Dynafit and “Tech” touring models). Third impressions, for long-term durability: No personal basis yet for evaluation. I saw a picture of toe frame breakage, but just one instance. The toe frame on my 2013-14 Speed Superlite is slightly thicker around some of the holes as compared to the otherwise identical frame on my 2012-13 Low Tech Race, so perhaps this has been addressed?